Why should your phone number be tied to your phone? You don't necessarily need a phone to make a call. The popularity of computing on the move means many of us carry a showroom of mobile gadgets, ranging from the obligatory mobile phones and tablets, to laptops and even hybrid laptops/tablets. All connect to the internet via mobile broadband and can (in theory) receive phone calls. Yet most of us stick to the antiquated notion that calls must only come on one device — your landline telephone or mobile phone. Why not receive calls on all your devices by using something akin to a universal phone number? There are several advantages to receiving calls on multiple devices, starting with saving money. If you're eyeing off that new iPad Mini or a Google Nexus 7, but don't like the thought of paying for both a phone and a tablet, or signing up to two mobile plans if you want 3G on your tablet, why not ditch your old phone and just use the tablet to make and receive phone calls, using a cheaper mobile broadband 3G plan without the phone component? 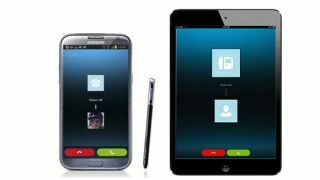 Like most tablets, the smaller 7-8-inch devices like an iPad Mini or a Nexus 7 aren't set up to receive phone calls, but if you add the Skype app (available on all platforms and on BlackBerry 10) and get yourself a Skype phone number, then you have yourself a working phone, albeit a very big one. Who needs phablets? You'll be able to make and receive calls whenever there's a broadband connection, whether it's via Wi-Fi or 3G. Alternatively, you might have a mobile phone whose battery struggles to make it through the day. Why not extend your ability to receive calls to your tablet or even laptop, if these are within range of a Wi-Fi hotspot? Chances are they'll still be running well after your phone has run out of charge. As a result, the use of a 'universal' number that works across all devices is becoming increasingly popular. In Australia this isn't provided by the Telcos, but by Skype and some VoIP providers. We all know you can use Skype to make free calls to other Skype users, but the key here is to extend Skype to be able to make calls to people who don't have Skype — using the standard landline and mobile phone networks — and receive calls from them. Unlike Skype-to-Skype calls, calling users on the phone networks with Skype costs money, but then you pay to do this with an ordinary telephone plan. In the US, you can also use Google Voice to do the same thing, but sadly the full Google Voice service isn't available to Australians. You can make calls with Google Voice from your device in Australia (you can access it via your Gmail), but you can't generate a phone number that people not using Google Voice can call you on. You can in the US, but not in Australia. There actually isn't such a thing as a universal global phone number in the public telephone network system. There's a service called 'Universal Personal Communications', which has set aside some numbers in the international calling space and allocated the country code of +878 to them, but so far the service been largely experimental and not seen except in some trials. The next best thing is the phone number that Skype (and Google Voice in the US) can give you. Since you can't get the Google number in Australia, here's how you get a Skype number. This number will let people call you on any device you carry and let you call any landline or mobile number. Go to 'Account details' and select 'Manage Features'. Select 'Get a Skype Number'.